Sheina Fernandes is obviously well liked. The All American Room was crowded with well wishers during the Brazilian’s signing Tuesday afternoon. She selected Oral Roberts University in Tulsa. The 5’10’ middle hitter from Porto Alegre, Brazil was named 1 st Team All-Conference for the second straight season after a season in which she led the conference in hitting percentage and blocks per game as well as finishing second in kills per game. She led Seward in five different categories including kills (490), kills per game (3.16), hitting percentage (.354), blocks (147), and blocks per game (.95). 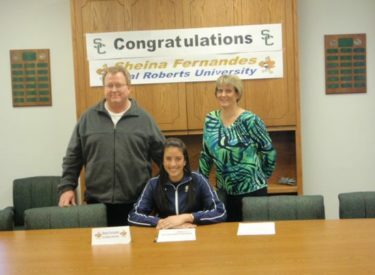 Fernandes helped the Saints win the Jayhawk West her freshman year and finish as runner up in the Region 6 last fall. Her interview airs Wednesday during the Sportsguys.